Chinese phone maker vivo is about to launch the Y17 in India towards the end of this month, a new report claims. The company hasn’t revealed anything about this smartphone officially, but a leak brings us its images and some of its specs. The smartphone borrows the design language from previous Y series smartphones like the Y91 – a waterdrop notch display on the front with a multi-camera system on the back accompanied by a fingerprint scanner. The Y17 will have 4GB RAM and 128GB storage as well as a 5,000 mAh battery. 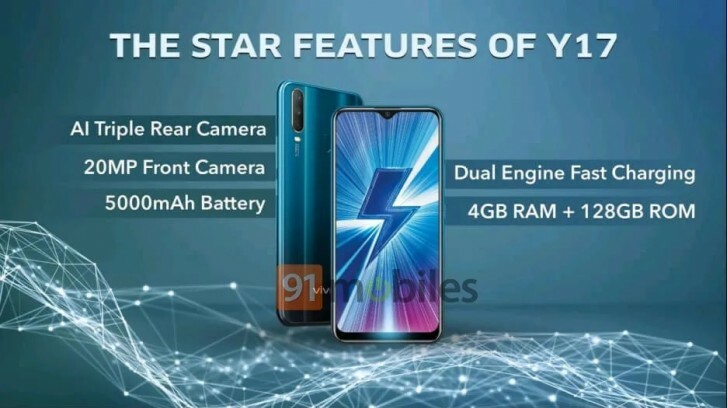 It will feature a 20MP selfie camera, but at this point we don’t have the details on the triple camera setup at the back. Previously leaked information suggests the vivo Y17 will be powered by Helio P35 SoC and built around a 6.35-inch screen. An exact date of its launch is currently unavailable, but we will hopefully hear more from vivo soon.